Posse up! Don Quixote has convinced five hapless souls to join him on a 32 km bike ride to Kuang Si Waterfall. We rent our noble steeds in the early morning for, as we will discover, the too cheap price of a $1.25, and start pedaling through the city. Whoops, the Portugese girl’s chain just fell off. The nobleman will help her fix it, okay, we’re good. Can’t work it, can’t manipulate the chain, it’s really stuck. Lyndsay from Montana stays behind, as the others, unaware of our recurring plight, continue onwards. A half hour later we’re no closer to fixing the bike, just a heck of a lot dirtier. The temptation of course is to say, “Sorry girl, ain’t my bike,” and pedal away. I guess it’s growth as a person that makes me want everyone I’ve come with to have a good time, and forces me to make sure she’s up and riding before I move on. I need tools, that little shop 100 meters away might have some. We walk the bike over, and communicate with a small Laotian man. He instantly grabs a wrench, and starts at it. His hands dirty, oily, and within five minutes, Portugal’s chain is back on and functional. Wow, saved me some time and heartache there. I’m grateful. I’m waiting for her to do something more than just verbally thanking him. Waiting … She’s getting back on the bike. I can’t hold back any longer. “Aren’t you going to tip him?” She pauses, and then purchases three small bottles of water for twenty cents apiece. She makes no additional move. When she turns around I pull out a dollar and hand it to the small man. 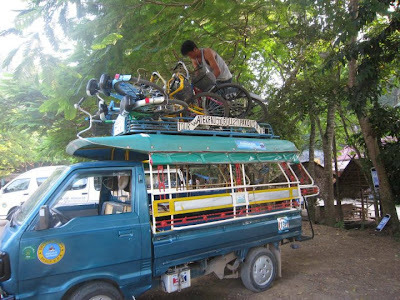 We’re way behind our cohorts, the hills becoming too steep to ride up, especially with our hoopties. Lindsay and Portugal start walking up. I’m too manly (see stupid) to admit defeat; persisting, pedaling hard, the slope seems to be swallowing me whole. To gain speed I change direction, moving almost sideways before careening off the path and into the bush for one-million negative style points … Then my chain falls off. 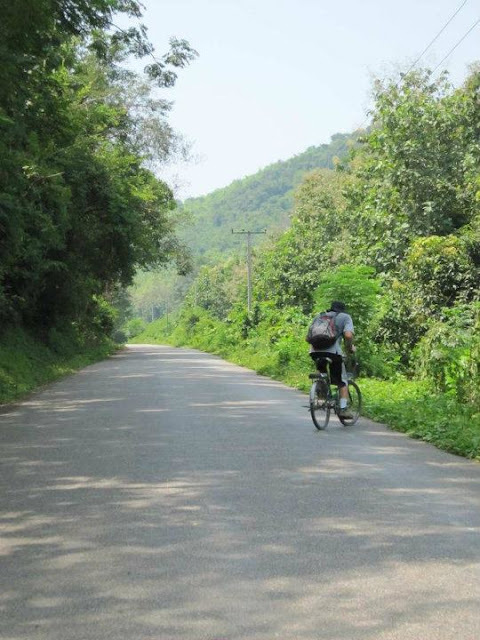 We continue, riding the flats and downhills, most often walking up the inclines, passing small farms, dodging chickens and water buffalo attempting to block the roads, and young Laotian children at play. Tourists in tuk-tuks drive-by smiling, shaking their heads, wondering at our choice of transport. Well, the choice of a charismatic, but not so bright Don Quixote, who convinced the others to join his quest. By the time we get to kilometer thirty, the girls are complaining of hallucinations, completely spent. They’re out of water, almost unable to move. The Don pours some of his own water down their throats, re-hydrating them, urging them onward. Eventually we arrive, and enter into the protected forest area, walking by a rescue center for Malaysian sun bears whose mothers have been poached in the wild, and onto Kuang Si Waterfall, the rainy season having upped the usual torrential volume of water cascading over the rocks. 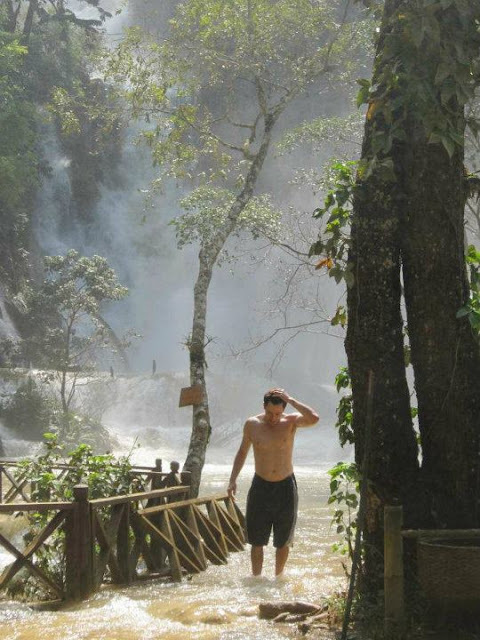 Kuang Si Waterfall- the hard journey was worth it! So beautiful! The area consists of several pools, the water collecting and then quickly dropping to the next. The current is voracious. Let it grab a hold of you’ll end tumbling down onto the jagged rocks below. I carefully wade into the water. The surroundings are ethereal, the tall trees and emerald jungle accented by the roar of the falls. Only Mother Nature’s bellows could sound so peaceful. 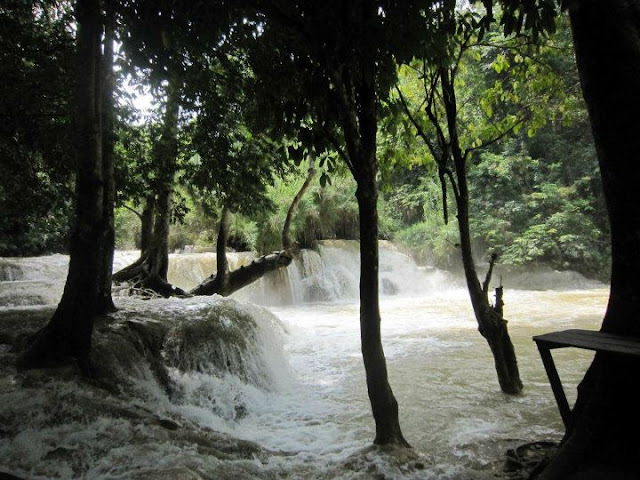 A Laotian man climbs onto a tree whose trunk curves and hangs over the pool near the junction of the falls. There is a rope hanging off an upper branch, but only after he pulls out a hidden hook do I realize how people manage to grab onto it. He pulls the line to him, swings over the water, lets go, and plunges in. Slowly, I make way there, noting where my feet are in relation to the slippery rocks, wading barefoot through a fast moving feeder stream, treading carefully. I climb the tree, hook the rope, and swing Tarzan-like over the water, releasing at maximum elevation. SPLASH. The current has me. I feel myself pulled quickly downstream. I look up for a second and realize I’m much closer to the next waterfall than I thought. I swim like a mad man towards the riverbank, racing sideways against the swift current. With fear coursing through me, I reach my feet down, the rocky riverbed sediment stopping my momentum; I’m able to stand. I breathe a sigh of relief. A minute apart, my friends Paul and Jeremy plunge from the rope and into the waters below. I yell for them to swim hard towards me, as if they needed my direction. Elated at having survived unscathed we play in the waters. “Fish,” replies one of the locals. The bites keep coming in the murky water, it's frightening. Suddenly I feel sorry for the worms. I am told they are “doctor fish,” often found in the massage parlors of SE Asia, used to nibble away the dead skin on patrons' feet. Another bite, this one hurts. I don’t know what they’re doing in this fast moving pool of water, but their getting a free lunch. We exit stage left, and up the riverbank. We hang out in the beauty of the forest for an hour, chatting with other travelers, listening to the gushing water. I feel both elated and peaceful at the same time, a tendency I have when being in the midst of stunning nature. If darkness weren't set to fall, I feel like I could stay here forever. The sun begins to disappear behind the mountains. No one besides me is even considering the possibility of cycling home. The girls negotiate with an eager Laotian who piles our bikes atop his Tuk-Tuk and drives us back into town. We arrive exhausted, having enjoyed our day at the magical waterfall, playing Tarzan, swimming, and in a reversal of usual circumstances, being served as lunch for the fish. Tonight Don Quixote will be back chasing windmills in his dreams. He's tired. It will be well deserved. Thanks for your visit. I was there during the dry season. Great post about a great trip!